A rebuttal on the site josephmatheny.com regarding a recent podcast and article that ran on Skeptoid, by Brian Dunning. There’s a podcast/website called The Skeptoid that is run by one Brian Dunning. The website seems to consist of a collection of transcriptions of the Skeptoid podcast, links to the podcast and a personal vita for Mr. Dunning. I learned that recently, Brian Dunningran an episode of the Skeptoid titled: Ong’s Hat, which was, predictably about the Ong’s Hat literary game. Brian Dunning claims that his podcast, “Skeptoid: Critical Analysis of Pop Phenomena is an award-winning weekly science podcast. Since 2006, Skeptoid has been revealing the true science behind popular misinformation and urban legends.” His words. While I haven’t sampled any of the other offerings on that Skeptoid website, I did read the text transcription of Mr. Dunning’s “investigation” into the Ong’s Hat urban legend and found it dismissive and misinformed in the following areas. 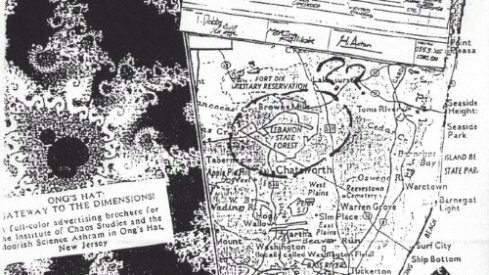 ONG’S HAT:GATEWAY TO THE DIMENSIONS! A full color brochure for the Institute of Chaos Studies and the Moorish Science Ashram in Ong’s Hat, New Jersey.